For years, since I started this little business, I’ve had a tug at my heart to do something good with this flourishing brand. To really pay it forward in a way that mattered. Before I was a designer, in another life it seems, I worked in non-profit development (aka fundraising). I was the Executive Director of Ballet Pensacola at the ripe old age of 23, a Development Manager for Covenant Hospice (another mission that really means a lot to me) and later managed the development efforts of the Women in Leadership in Philanthropy program at the University of South Florida. Suffice it to say, GIVING is so important. I’ve searched for a cause that really connected with my heart and the heart of this brand and last year, at Engage!12 in West Palm Beach, I met Paige Chenault. Paige is an event planner in Texas. Paige is also the mastermind behind The Birthday Party Project. I’m pretty sure I bawled my face off while Paige spoke about the mission of The Birthday Party Project. TBPP’s mission is to celebrate the lives of homeless children and youth through the magic of birthdays. By partnering with homeless shelters, TBPP provides birthday parties and gifts for all their resident children between the ages of one and eighteen. Each birthday boy or girl receives a crown, ribbon, cake and a gift. Watch this video and prepare to reapply your mascara. Last year, for Christmas, instead of giving each other Christmas gifts, Bryan and I decided we wanted to pay it forward in a little way. While having dinner at our local Outback, our waitress smiled at our squirmy then nearly-two-year-old and told us she had five children. As we were finishing our meal, we overheard her tell the table next to us that she dreamed of owning a KitchenAid mixer so that she could bake Christmas cookies with her kids. The next day… (we wrapped it and left it at Outback with no from name, just a wish for a wonderful Christmas). That afternoon we also headed to our local Target and purchased birthday hats, streamers, birthday candles, colorful plates and napkins along with a pile of silly kids’ bubbles, whistles, crayons and happy favor toys. Off we sent that big box to Paige and The Birthday Party Project. This lit my heart on fire and made me so excited about doing something TANGIBLE to give back. Rather than just sending money… it’s so powerful to FIND NEEDS and MEET THEM. There are a lot of good causes out there and a lot of people in need. As the daughter of a teacher and mom to a little boy, I honestly believe every little one deserves to be celebrated no matter their circumstances. I’m thrilled to announce our new Birthday Plates benefiting The Birthday Party Project. 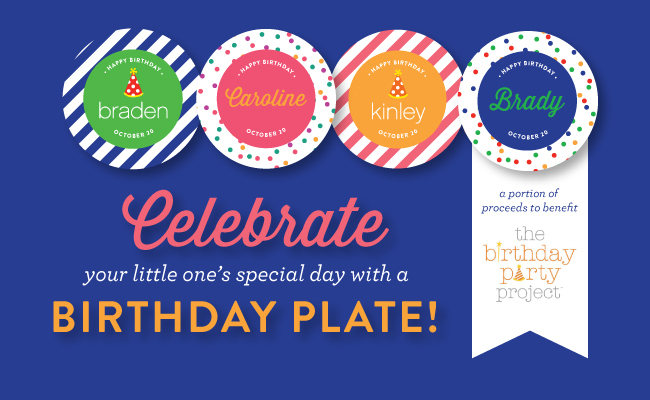 For each birthday plate purchased for YOUR little one, we will donate $5 worth of birthday party goodies to TBBP. Use YOUR birthday party plate to celebrate with your little one on their special day year after year! Wishing you all a wonderful week ahead! I’m home with a sick little guy today and even though I was bummed this morning at the thought of losing an entire’s day worth of momentum on my to-do list, I’m so grateful for the chance to love him up all day. I’m reading an amazing book right now called Margin (thanks for the recommendation, Emily Steffen!) and its rocking my world. I’ll share more later… but its incredible. I’m pretty sure Richard Swenson wrote the book directly to me.